We hope you enjoy our selection of photographs in this picture gallery. 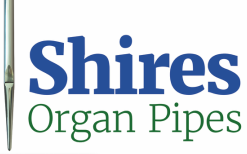 You'll find members of the Shires team in the workshop using the traditional tools and techniques we employ daily to create organ pipes large and small for organ builders throughout the world. If you have any questions about what you see, we'd be pleased to hear from you. To dwell on a particular picture, please click on the main image and select 'pause'.